A series of text messages sent from the phone of Olympic swimming coach Bob Bowman to a recently retired bronze medallist in 2011 reveal a sexually graphic tone, including one message that read: "Sean wants you. I want your brother!" 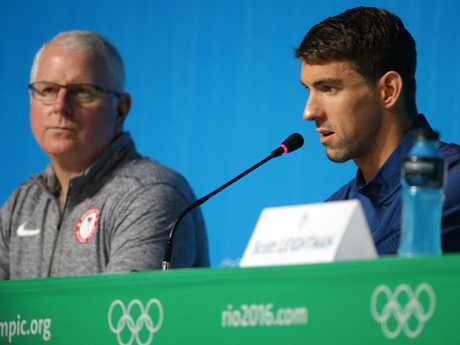 Bowman, the coach who guided Michael Phelps to 23 Olympic gold medals, was referring to fellow coach Sean Hutchinson in the text message exchange, which was obtained by the Arizona Republic as part of a public records request from Arizona State University and published Wednesday by USA Today. "This is gross, who is this?" Caroline Burckle replied minutes later. "Bob Bowman," a reply read. "Who is this hon?" Minutes later, another text was sent that read: "This is Sean now how you?" Another text was then sent from Bowman's phone saying, "Yea, baby." "What's bout?" another message from Bowman's phone read. "Sexual tension?" "Is this still Sean?" Burckle replied. "Yea baby," read a reply. "I'm a little confused as to what is going on, but if this truly is Bob and Sean, this is really inappropriate," Burckle wrote. "How so?" a reply read. "Just really crossing the line," Buckle replied. "Not really crossing any line dear," Bowman's phone replied. "All right, it's getting late, if this is bob and Sean, then please don't text me anymore," Burckle replied, wrapping up the charged exchange. "But if it's someone else playing a joke, Please tell Me who it is because I don't think it's funny." Burckle, then 24, has said she reported the incident and forwarded the texts, along with a voicemail, to USA Swimming officials. Bowman's boss, national team director Frank Busch, later put Bowman on notice about the incident, saying, "It is important you understand the severity of this situation," the Southern California News Group first reported on July 19. Burckle's brother, as referenced in the text exchange, is Clark Burckle, a swimmer who later became a member of the 2012 US Olympic team. Bowman was also on that team's coaching staff, USA Today reports. Bowman has apologised for the messages, which Burckle has described as "so aggressive" that they left her shaken. "I was disgusted," Burckle told the Southern California News Group. "I felt violated, felt sad too. This was a sport that I had just left and loved and so I felt very sad." But Bowman claims the reference to Clark Burckle was strictly swimming-related. "The exchange was inappropriate, which is why I apologised for all of it," Bowman wrote in a message Wednesday to USA Today. "Her brother was swimming really well at the time and I had interest in coaching him. Clearly, this was not the manner or forum through which I should have communicated, nor should I have allowed any other individuals to communicate through my device, which is what I expressed to her when I apologised to her in a follow up phone conversation." Bowman noted the "good relationship" he now has with Burckle, who, along with her brother, could not be reached for comment on Wednesday, according to the paper. A spokesman at Arizona State University, where Bowman currently coaches, declined to comment on his status Wednesday, citing an ongoing review. After sending the texts in 2011, Bowman was later named head men's coach for the 2016 Rio de Janeiro Games. Tim Hinchey, CEO of USA Swimming, said last week that he would've handled the situation differently if it had happened under his leadership. "Certainly from hindsight, I don't think that's how I would have handled the situation quite frankly," Hinchey said. "Regardless of age, gender, athlete, non-athlete, no one deserves to have communications like that." Hutchinson, who is no longer affiliated with USA Swimming, is being investigated by the Department of Homeland Security and authorities in Washington state after a former world champion swimmer, Ariana Kukors, accused him of sexually assaulting her for nearly a decade. Kukors has also filed a civil suit against him and USA Swimming. Burckle, meanwhile, said she reported the inappropriate text exchange because she was "haunted" by the episode for the last seven years. "For me it's the principle of it," Burckle, now 32, told the Southern California News Group. "It's about giving people the respect they deserve and shouldn't have to ask for. … Athletes shouldn't have to act a certain way to please their male coach."